Posted on May 30, 2015 by CHE Sadaphal — Enter your password to view comments. Posted on May 16, 2015 by CHE Sadaphal — Enter your password to view comments. Posted on February 21, 2015 by CHE Sadaphal — Enter your password to view comments. 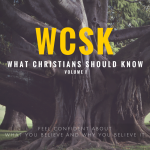 Protected: WHAT CHRISTIANS SHOULD KNOW (#WCSK) PART I: WHAT IS CHRISTIANITY? Posted on January 17, 2015 by CHE Sadaphal — Enter your password to view comments.